It’s a warm Friday night in October. The bleachers overlooking the football field are packed with Shorecrest alumni, students and families as the Chargers take on a long-time rival in the Homecoming football game. As the teams leave the field for halftime, five young women and five young men, the 2015-16 Homecoming candidates, walk onto the field with their parents. 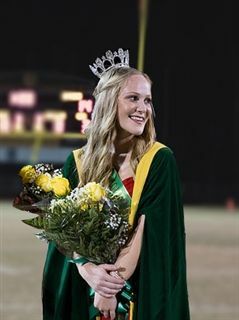 After all the candidates are announced, a hush falls over the crowd as the 2014-15 Homecoming queen steps onto the field for a suspenseful ten-yard walk to crown the new queen. The grandstand erupts in cheers as she places the tiara on the golden locks of Shorecrest Senior Megan Freedman. For many high school students, this moment would be the pinnacle of Homecoming Week, maybe even of high school, but if you talk to Megan Freedman about her senior year, this moment doesn’t even come up unless she is prompted to talk about it. As several of her peers and teachers note, Megan is very humble and not one to focus on herself. Instead she talks about the way her class overcame three years of apathy to unite and win their senior year Homecoming week competition. “Our whole grade just came together. We had so much fun. I wish I could re-live the week over and over again!” She lights up as she talks about the work her class put into planning and preparing for the week of school spirit and fun. Her quiet enthusiasm and supportive nature don’t just extend to the Shorecrest community. Although she spent much of her time at Shorecrest leading the cheerleading squad and tending to her studies, Megan says one of the most fulfilling parts of her Shorecrest career has been her involvement in service. Locally, Megan has spent countless hours involved with Habitat for Humanity - she served as co-President of the Shorecrest Habitat for Humanity club. But in addition to spending time helping those in need locally, Megan was determined to lend a hand outside of her St. Petersburg community. Megan is part of the Shorecrest Global Scholars Initiative (GSI), a program that provides students opportunities to study world cultures through enhanced academic coursework and attendance of lectures and presentations on global issues. 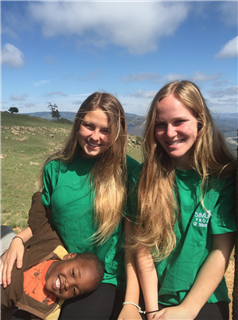 During her junior year, after enrolling in a Sub-Saharan Africa course at Shorecrest, Megan was so moved by the concepts of the class, that she and another student lobbied the school administration to have time off from classes to travel to South Africa on a two-week service trip. They planned much of the trip themselves as part of their GSI capstone project. One of her teachers perhaps says it best, “Megan’s humanistic impulse is simply sterling.” Her involvement in creating and executing a trip of such magnitude, truly demonstrates a profound commitment to service - something that has been instilled in her at Shorecrest from a very young age. From making quilts for local shelters in kindergarten, to buying presents for children in foster care through the annual Shorecrest holiday gift drive, Megan has learned the importance of “giving back” from the time she walked onto campus. As a Shorecrest “Lifer” (a student who has attended Shorecrest for 12 or more years), and the daughter of a Shorecrest alumna, Megan has grown up in “the Shorecrest bubble.” She explains, “I’m so comfortable here. I can go up to anyone in my grade and talk to them and it feels so so natural. I know everyone, and everyone knows me. My brother and sister have some of the same teachers who taught me, and some of my teachers taught my mom!” Megan knows that being part of the nurturing, inclusive Shorecrest community is what she’ll miss the most. At the same time, she is excited to open the next chapter of her life as she begins her college career as a student at the University of Florida. “It’s kind of contradictory, but I’m so excited to meet new people and have new experiences.” But don’t be surprised if you see Megan back in St. Petersburg in a few years. As excited as she is to have new experiences elsewhere, “I would love to come back to St. Petersburg and start my life here.” She’s not sure exactly what she wants to do yet, but all who know Megan know that with her caring heart and sharp intellect, she’ll find success in whatever she pursues. Sharing the same smile at Shorecrest in 2008 as in 2016!